Genealogy research can lead you to many fascinating stories and people, both living and dead, and Matthew “Matty” Loughran ranks among the most memorable for me. I’ve always enjoyed a good sea story, and Matty served up a dandy one for me several years ago while helping me research the service record of my wife’s grand-uncle Valentine Vincent Baker, a WWII merchant seaman from Philadelphia who went down with his ship in 1942. I met Matty on the Internet in 2006 after posting a query about Uncle Val and his ship, the SS Muskogee, on a message board for folks seeking information about service records and veteran benefits for WWII-era merchant sailors. Matty was an old salt himself, having served in the Merchant Marine at age 17 near the end of the war after the Navy rejected him for having poor vision. After the war, he spent two years as an Army medic and later worked for the U.S. Postal Service until his retirement n 1982. In his late 70s when I met him, Matty lived in Riverhead, N.Y., and was the historian for the North Atlantic Chapter of the American Merchant Marine Veterans and a counselor and advocate for the veteran rights of WWII-era merchant sailors and their families. On my wife’s behalf, he cut through many months of red tape in obtaining service records for Uncle Val from the U.S. Coast Guard as well as the Maritime Administration of the U.S. Department of Transportation. Those included photocopies of Baker’s Continuous Service Discharge Book, which furnished personal information as well as a photograph of Val along with his signature and fingerprints and documentation of previous merchant sailings from as far back as 1938. Matty also sent reference book photos and notes about the SS Muskogee, including several mesmerizing images of the ship’s actual sinking obtained from declassified German war records through postwar research by George Betts, son of Muskogee skipper William Wright Betts. A 36-year-old bachelor, Uncle Val had an Ordinary Seaman rating and was serving as a messman aboard the SS Muskogee, an oil tanker carrying crude oil from Venezuela to Halifax, Nova Scotia, when it was torpedoed and sunk by the U-123 German submarine on March 22, 1942 , in a rough sea approximately 450 miles SE of Bermuda. The ship went down in less than 20 minutes and all hands were lost. 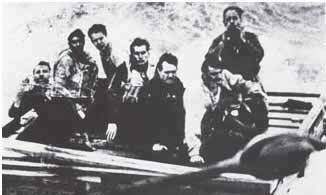 Members of the U-123’s crew took photos of the sinking for propaganda purposes, and they included images of two life rafts from the doomed ship and a closeup shot of one raft with seven recognizable Muskogee crewmen, none of which was Baker. That closeup photo later served as the inspiration for the American Merchant Marine Memorial sculpture in Battery Park, NYC, which was dedicated n 1991. Matty further provided online links to a compelling story about a 1987 meeting between George Betts and U-123 commander Lt. Commander Reinhard Hardegen of Bremen, Germany. Turns out Hardegen remembered details of the Muskogee’s sinking from his log book and was able to substantiate the time, date and place of the encounter and explain the circumstances that prevented the submarine from picking up any of American survivors. From the Coast Guard, Matty was able to obtain a Report of Casualty and a Certificate of Honorable Service, which entitled Baker to a memorial marker from the U.S. Veterans Administration. It also provided a list of medals, badges and citations authorized for Uncle Val and a copy of a Presidential Testimonial Letter from Harry Truman. 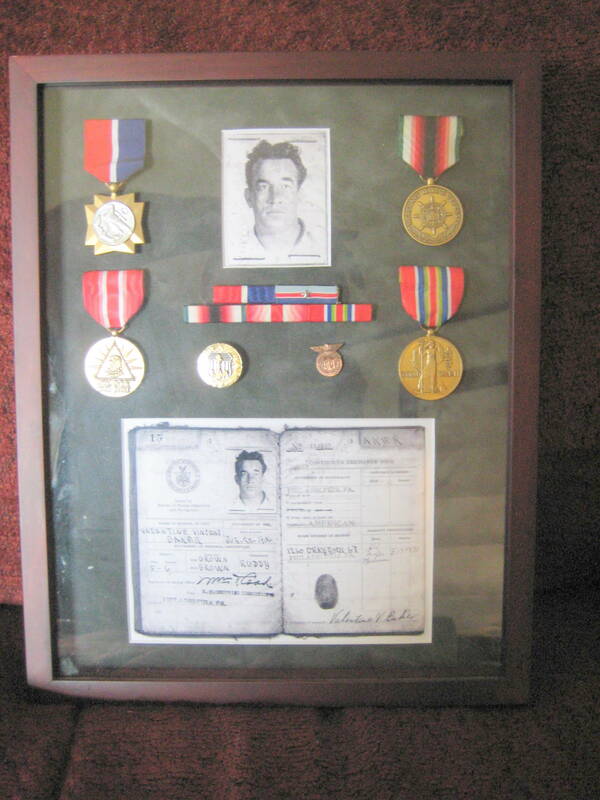 I was then able to purchase replacement medals for Uncle Val through the U.S. Coast Guard Academy and put them in a shadow box display along with images from Baker’s discharge book. One problem. The Coast Guard no longer had copies of the Mariner’s Medal, awarded to Merchant Marine sailors in lieu of a Purple Heart, as they were discontinued after WWII and only 6,600 of them were ever authorized. Mariner’s Medals were then going for hundreds of dollars when I checked them out on ebay. But Matty put me in touch with Patricia Thomas, a secretary for the Maritime Administration in Washington, D.C., who sent me a Mariner’s Medal for no charge, allowing me to put the finishing touch on Uncle Val’s shadow box display. Thrilled with the result, I shared it with my wife and daughter and took a photo of the shadow box to send to Ms. Thomas, along with my appreciation for her help. I also emailed the shadow box photo to Matty Loughran — perhaps the only man in America who would appreciate the project as much as I — and phoned him to reiterate my sincere thanks for all his help. Alas, Matty was no longer available as his wife Johanna informed me that he had died. The news hit me like a torpedo. All I could do was offer Johanna my thanks and condolences — and a parting promise to think of Matty whenever I gaze at Uncle Val’s medals and images. 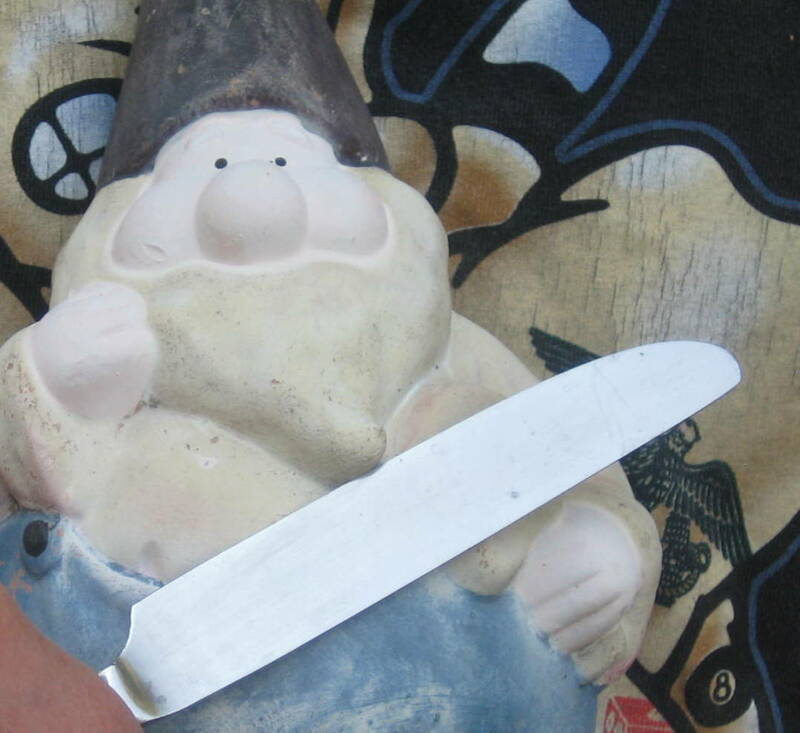 Two old salts linked by circumstance and Ransom Man respect.